A white fungus is visible on the center bat's nose. A mysterious affliction that has killed at least a million bats in the eastern United States has reached Ohio. Wildlife officials have confirmed the first Ohio case of white-nose syndrome in bats hibernating in an abandoned mine in the Wayne National Forest in Lawrence County, the Department of Natural Resources announced this morning. The fatal disease was first found in a New York cave in 2006. It has since spread through 15 states and two Canadian provinces, as scientists scramble to try to understand it. A fungus, Geomyces destructans, grows into white tufts on a bat's nose then spreads to other bats. 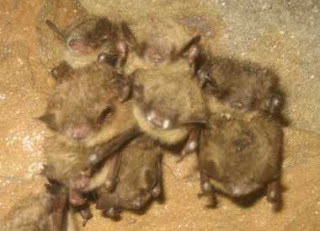 The fungus does not kill the bats directly, but seems to cause them to rouse from hibernation too often and too early, which leads to starvation. Humans can transport the fungal spores on their shoes, clothes and gear from contaminated caves and mines. Officials are asking that people help slow the spread of white-nose by staying out of caves and mines. The fungus requires cool temperatures and does not affect humans. More than 1,300 bats are hibernating in the closed-to-the-public Lawrence County mine; 69 percent are little brown bats, 21 percent are endangered Indiana bats and 10 percent are tri-colored bats. There were fewer big brown bats and northern bats. A Georgia laboratory evaluated samples collected in the mine this and last month and confirmed the fungus. Bats are important predators of mosquitoes, beetles, moths and agricultural and forest pests. "Recent research predicts that white-nose syndrome will likely drive even the once-common little brown bat into regional extinctions," says Nina Fascione, director of Bat Conservation International. "We are struggling against the most precipitous decline of North American wildlife species in a century. The future for hibernating bats looks grim." Anyone who sees more than six dead bats or large numbers of bats flying when it is less than 40 degrees outside is asked to call 800-WILDLIFE (945-3543) or email wildinfo@dnr.state.oh.us. Learn more at White Nose Syndrome, Bat Conservation International and Fish and Wildlife Service/whitenosesyndrome.